This Black Cup Holder Child Theater Recliner Chair will make a statement in any living room or playroom. Your child will love having a spot to rest his/her drink while enjoying a movie or reading a book. Perfectly suited for the perfect child, this high-quality recliner comes in a variety of kid-durable fabrics which make cleaning up crumbled cookie crumbs a snap. The Black version of this chair is a soft leather-like vinyl. 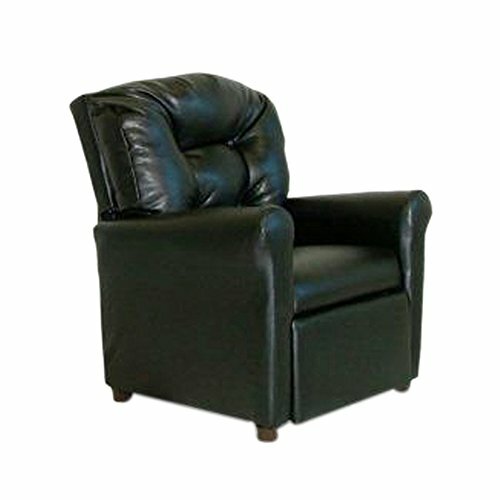 Soften up someone you love with the Black Cup Holder Child Theater Recliner Chair. Expect a soft hug and a smile. Dimensions: 27" highx 24" deepx 22" wide. Weight limit: Up to 100 lbs. Weight of Chair 32 lbs.